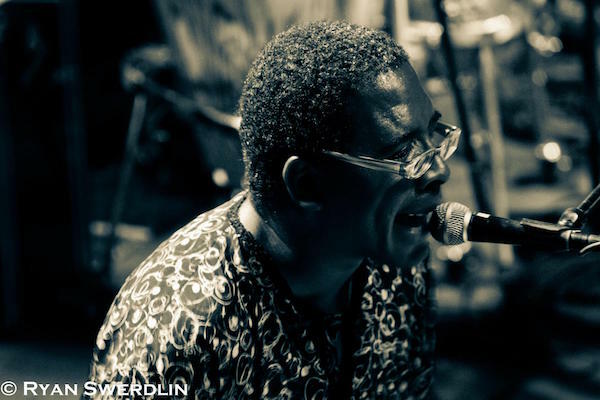 JUAN MEDRANO “COTITO” at Terraza 7 on Thursday October 15th, 2015 at 9:00 pm. In his Afro-Peruvian percussion workshop, Juan Medrano Cotito focuses on the three fundamental rhythms of Lando, Festejo and Zamacueca. The foundation of each rhythm on cajon is presented in a way which is very accessible to beginners but also contains seeds of exploration for more experienced players. Once the students have been sufficiently familiarized with the rhythms they will learn the basics of how each of the traditional auxiliary instruments such as the quijada, cajita and campana fit elegantly into the cajon patterns. Questions are welcome throughout the workshop and focus is also given on the students exploring their own voice on the instrument. Cajon – fundamental resonating box instrument of Afro-Peruvian music. Cajita – small wooden box with a hinged lid that is hit with a stick. Quijada – desiccated donkey jaw-bone. No Replies to "JUAN MEDRANO “COTITO” Afro-Peruvian Concert and Workshop"